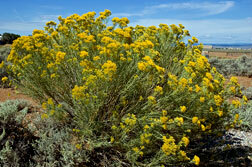 Native to the Rocky Mountain high desert, chamisa is also known as gray rabbitbrush. It is a hardy shrub that likes full sun and native New Mexico soil. From late summer through early fall, chamisa bears clusters of golden flowers that are fragrant and attract butterflies, but some people do not like the way the blossoms smell (as indicated by the botanical Chrysothamnus nauseosus). Once established it requires little or no water except in the very worst drought years.